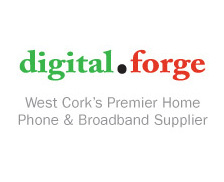 We supply Broadband and Phone Services all over West Cork providing high speeds and prices comparable to urban centres to many remote rural locations including most villages and towns. Our coverage extends from the Mizen Peninsula and includes many island locations such as Bere Island, Cape Clear, Sherkin, Heir, Whiddy, etc., Baltimore Peninsula, Skibbereen, Dunmanway, Drimoleague, Bantry, Sheeps Head, Mealagh Valley, Kealkil, Coomhola, Glengarriff, Adrigole, Allihies, Castletownbere, Inchigeela, Kilmichael,Ballingeary Ballyvourney and all areas in between! View our coverage map below to see if you can avail of our service. The areas coloured red indicate DigitalForge phone and broadband coverage. There will be situations when we cannot provide service due to obstructions in the way such as trees.